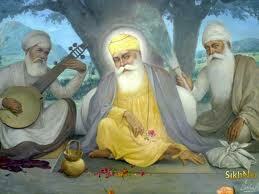 Guru Nanak was the founder of the religion of Sikhism and the first of the ten Sikh Gurus. Guru Nanak was born on 15th April 1469 in the village of RaiBhoi di, Pakistan. Nanak’s Father is Kalyan Chand Das Bedi, he was Accountant for crop revenue in the village of Talwandi. Nanak’s mother was Tripta and Nanak had one elder sister named BibiNanaki. In childhood Nanak have interested in Divine subjects and also they give brief explanation about the implicit symbol of the 1st letter of the Alphabet denotes unity or oneness of God. one day nanak was sleeping and Poisonous cobra seen to shield the Nanak’s head it creates miracles and strange to other childhood. After his sister Marriage Nanak’s stayed with his sister and work with Daulat Khan at the age of 16. Later Nanak’s sister recognized Divine qualities within Nanak. She encouraged his interest and support him to study and travel.In the town of Batala, he married Mata Sulakhni and the couple had two sons, Lakhmi Chand and Sri Chand. In 1499, Nanak failed to return from this stream and local people thinks he drawn in to river but body of Nanak’s was not found. After three days ,Guru Nanak reappeared, staying silent. Then next day he spoke to gathered peoples "There is neither Hindu nor Muslim so whose path shall I follow ? I shall follow God's path. God is neither Hindu nor Muslim and the path which I follow is God's". In that day onwards Nanak is called as “GURU” and “Religion of Sikhism”. After Nanak’s Spirtual Journey started and mainly Four major journeys, 1st tour being towards Bengal and Assam. Second tour south towards Tamil nadu, Third tour North towards Kashmir, Ladakh and tibet and final towards west Mecca and medina, Baghdad in Arabia. Sharing with others, helping those with less who are in need. Earning or Making a living honestly without exploitation or fraud. Chanting the Holy Name and thus remembering God at all times. In 1539 Guru Nanak was died.